The Chronicles of Gillean is a thrilling and action-packed story featuring highly developed characters and a plot designed to be engaging and thought-provoking. Within the futuristic storyline is the mystery of secret societies, murder, political intrigue, and heart-pounding suspense. While the category is science fiction, as the story unfolds it gives way to so much more, and incorporates within the journey a highly cultivated historical fiction. by the shocking appearance of a bloodied Confederate cavalryman and his dying warhorse. Little do the onlookers know that the whole world is about to change. In its most basic form, The Chronicles of Gillean series is the story of life and the everyday battle between good and iniquity, and one man’s quest to find meaning. On other levels, it’s a thought provoking exploration of issues in philosophy and politics, and of economics and war, not only in the future, but in the past. It’s the story of what happens when advances in science and technology occur in the soil of resilient human passions for power and control. Jake Gillean’s life is woven into the tapestry of Chronicles in such a way that his journey will mean different things to different readers. His life is one of discovery that pushes through uncharted seas to the strange land where DNA ends and awareness begins. It’s free will versus determinism. It’s also a story that outlines the disconnect between science and ethics, and the delicate balance between liberty and freedom on the one hand, versus an all-powerful government on the other. It’s a look at how people through the ages, people who are inherently good, through differing experiences and learning, can be led to fervently defend, attack, and wage war for ideas that are diametrically opposed. It’s also the story of what one man is not only willing to die for…but what he might be willing to live and fight for. Lt. Col. Jake Gillean’s journey unveils some of the most wonderful and some of the most corrupt aspects of humanity. The darkness that lurks in the heart of man is pulled and dragged out of the shadows. It is cast out in the open for all to see. 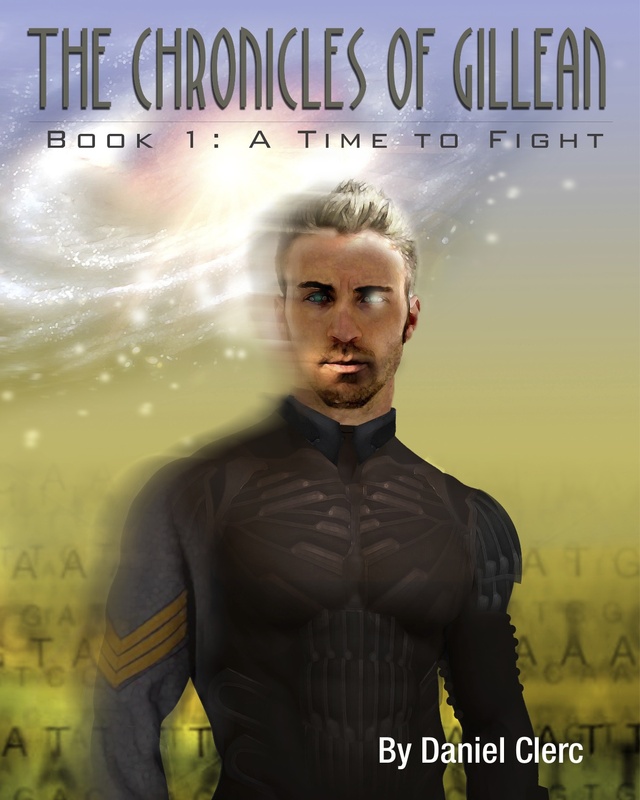 The Chronicles of Gillean is a story of war, not only in the future, but in the past. It’s one man’s extraordinary love for his wife and the unbreakable love of a father for his children. It’s the story of how that man, a warrior who stood as a knight in gleaming white armor, became lost and fell so far that he would lose everything…including his soul. As the world fell into darkness, he believed that he failed to fulfill the promise he made to his children—a soldier’s promise that he would return home. As he collapses to his knees, as he screams out and rips at his vestments…it’s a story of the indomitable power of hope.